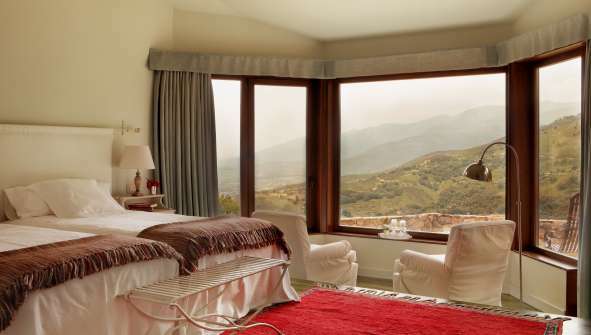 Boutique Hotels & Rural Homes in the mountains of Sierra de Gredos, Spain! Are you looking for Hotels and Rural homes near Sierra de Gredos? In Rusticae we selected the best Rural Hotels in Gredos at the best prices. Enjoy Gredos with our exclusive Rusticae offers! Sierra de Gredos is one of the most extensive mountain ranges of the Central System mountain range and is characterized by its alpine terrain, its granite rocks and its glacial legacy, which translates into numerous lagoons, gorges and cliffs. This mountainous bastion is based on the territory of several autonomous communities: Castilla y León, Extremadura, Castilla-La Mancha and Madrid. Avila is the province that takes all the prominence, because here lies most of the Sierra de Gredos. The Regional Park of the Sierra de Gredos, which houses the most emblematic places, such as the Laguna Grande de Gredos, the Circo de Gredos or the Almanzor peak, the highest peak of the entire Central System with its 2,592 meters above sea level. Among the fauna of the Sierra de Gredos we can find the mountain goat, the roe deer, the red partridge, the imperial eagle, the woodpecker or the griffon vulture. Although the most outstanding are its endemisms (local species), like the Western Spanish ibex, the common toad of Gredos, Iberolacerta cyreni, the European snow vole and the fire salamander of Almanzor. The Sierra de Gredos also offer the opportunity of a wide variety of activities. You can go horse riding, hiking, mountain biking, climbing, mushroom hunting, archery, kayaking or winter sports, when the snow covers the mountains. Places not to be missed are: the Laguna Grande de Gredos, the Circo de Gredos, the Lagunas del Trampal, the Prado de las Pozas, Los Galayos waterfall, the Cinco Lagunas cirque or the Cañada Real Leonesa Occidental. Many villages that deserve a visit appear mids in this nature. Some are: Hoyos del Espino and its Gothic hermitage of the XV century; Candeleda and its beautiful popular architecture; Navaluenga and its Roman bridge; Guisando El Barco de Ávila and its walls; Arenas de San Pedro and its Castle of Don Álvaro de Luna; Mombeltrán and its castle of the Dukes of Albuquerque; o Navarredonda de Gredos. Another claim of the Sierra de Gredos is the observation of stars, thanks to the quality and transparency of its night sky. Not in vain, the north face of the Sierra de Gredos obtained the Starlight Certification in 2013, thus becoming the fifth geographical area in Spain to achieve this certification, after the island of La Palma, the La Rioja Biosphere Reserve, the Tenerife municipality of Granadilla de Abona and the Montsec de Lleida. This certification aims to guarantee the ability to enjoy the vision of the stars and know the associated scientific, cultural, natural and landscape values. In the case of the Sierra Norte de Gredos, it ensures the availability of a dark sky in a radius of 900 km², covering 30 municipalities. From the traditional gastronomy of the Sierra de Gredos towns, dishes and products stand out: the beans, the olives of the Tiétar Valley, the goat cheeses, the Iberian ham, the roast lamb, the figs, the stew, the milk fried, roasted lamb chops, Candeleda chestnuts, mushrooms or torrijas. Enjoy and discover this beautiful area while staying in a luxury boutique hotel, specially selected by Rusticae!